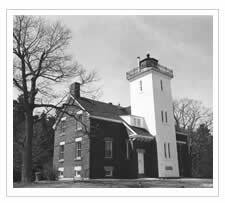 40 Mile Point is a two-story duplex with a tower incorporated into the center of the side-wall facing Lake Huron. Its footprint measures 35 feet by 57 feet. Constructed on a 20" thick foundation, each 16" thick exterior wall is made up of double brick walls separated by an air space that provides the only insulation. The 12-foot square tower stands 52 feet in height and is capped by an octagonal cast-iron lantern room. The mirror-image apartments on each side of the dwelling provided complete privacy for the keeper and his assistant. The main lighthouse structure models the Big Bay lighthouse which was being constructed simultaneously near Marquette in the Upper Peninsula.